What's new in "Yarraman" land? Welcome to this new feature on my website. The contents of this page will be updated regularly as I will use it to let you know about things or changes that you may want to or need to know regarding this website or myself. In the very near future I will be acting as a "Natural Hoof Advisor" (NHA) in association with Easy Care Inc. - an innovative company that specializes in Natural Hoof Care Products for Horses, such as Easyboot®, Easyboot® Epic™, Boa Horse Boot™, Old Mac's Multi Purpose Horse Boot, and EasySoaker . You will be able to purchase these products through this website. Yes, an exciting shop front for barehoof advocates and trimmers will be opening here soon! Please do take the opportunity to learn about and perhaps purchase this fantastic "wellness tool" for yourself and your horses: The Red Light Healing Torch (photon stimulation of acupoints through non-coherent monochromatic light (also known as photopuncture). (Click here to read more). I use it all the time! After a lot of soul searching, I have decided that I will not renew my license as Strasser Hoofcare Professional (SHP). The reasons for this decision are personal. I will continue my education to become the most effective practitioner I can be. My love for horses and the desire to help them is unconditional. Teaching my clients is part of my job - I would like to help them to become the best they can be for their horses.. I have created the term "HOOFCARE COACH" to describe what I do when I return to do "follow up" workshops after a hoof trimming clinic. To continue coaching owner trimmers to become more competent is not only necessary, but also part of the responsibility I have towards them and their horses. Claiming that one can teach someone how to trim a horse in a week-end course is irresponsible and dangerous. I am very happy to announce that my friend Kelley Walker of Performance Horse Therapies P/L will join me as guest lecturer on "muscle function and therapy". Her input will make my Trimming Workshops an even more info packed educational experience for horse owners. I have now activated the "Australian Equine Hoofcare and Soundness Survey" and would like to invite you all to participate. This survey will give us all a better insight of what is, what should and what could be. The results will be released early next year. It won't take long to fill in... please help ! The more the merrier! The results will be published as soon as I had time to sort and count the entries. You will find the link to the results as soon as they are available on the home page. been cancelled. (Lack of interest, would you believe!). Perhaps it's time for this organisation to review and overhaul its public- as well as its internal relations. One can not change a mind that has already decided an outcome. For ever in my heart are the horses "Curry", "Pearl" and "Shorty" and their amazing owners. I am so thankful that I have become part of your life. Every minute with you has enriched mine more than you can ever imagine. This is a weatherproof barefoot sticker for your car (or where ever). Hurray! I am proud to announce the release of the AEBM DVD. This entertaining and informative introduction to barefoot is available through the Australian Equine Barefoot Movement Inc. 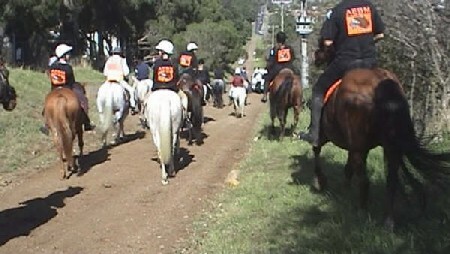 The 3 day "Hoofcare Boot Camp" is Australia's most comprehensive short course for horse owner- and maintenance trimmers. Please take note that this clinic will be an entry requirement for a professional certification course that will be launched in the future. Thanks to Bill McCallum of "Saddle-Up", I am now able to sell "Best Friends Grazing Muzzles" as effective laminitis/founder prevention! The muzzle comes with safety halter and is recommended by the Laminitis Trust. I have been very impressed by this product and am recommending it for rehab cases as well as for every day riding. I haven't updated this little blog for quite some time. A very dry summer has gone. Now there is hope that this fairly wet winter has broken the drought - at least here in Victoria. In the last few months, many horse owners had to realize that it is very difficult and costly to keep horses. The fodder shortage and the price increases of the feed that was available was felt by everyone. Many horses changed ownership. Many were not so lucky. Many owners decided that ending their life was the kinder thing to do, as for most the uncertainty of their fate after a sale was no option. I am just grateful to have some very dear friends in another State (SA) who helped me to source some hay for my horses.. It will bring them through the winter. for Equine Barehoof Trimmers with a Nationally recognoized accreditation! I am proud to be one of the "in field" mentors for the students. Talking about education: The value of "weekend seminars" should not be underestimated. However to my great concern I had to learn that some course participants of weekend clinics have set up business and are now engaging "apprentices" to share their workload! It is irresponsible that overconfident, under ediucated trimmers start to "teach" and encourage amateurs to "treat" pathological hooves. It is clear by the mess they leave behind that horseowners must request proof of education and qualification. A VALID QUALIFICATION CAN USUALLY ONLY BE ACHIEVED IF THE SUBJECT HAS UNDERGONE A SKILL ASSESSMENT PROCESS OF SOME KIND. The participation in a few week-end seminars or a 5 day clinic does not fullfill this criteria. Neither does the fact that some are "students in training" of recognized o/s accreditation courses. Before they have not passed an assessment process, they are STUDENTS, and their work should be supervised! Being a student is not a qualification! Some of this country's selfdeclared leading hoofcare educators themselves have never completed a formal eductaion on the subject or have sat an exam to proof their competence, so watch out for marketing hype! I believe hoofboots should be used for rehabilitations, transitions and for horses that are being ridden on ground their hooves have not been conditioned to as a temporare "band-aid". Booting hooves should not be an excuse for incompetent trimming or giving the owner the "edge" that allows him/her to push a horse beyond its natural abilities. 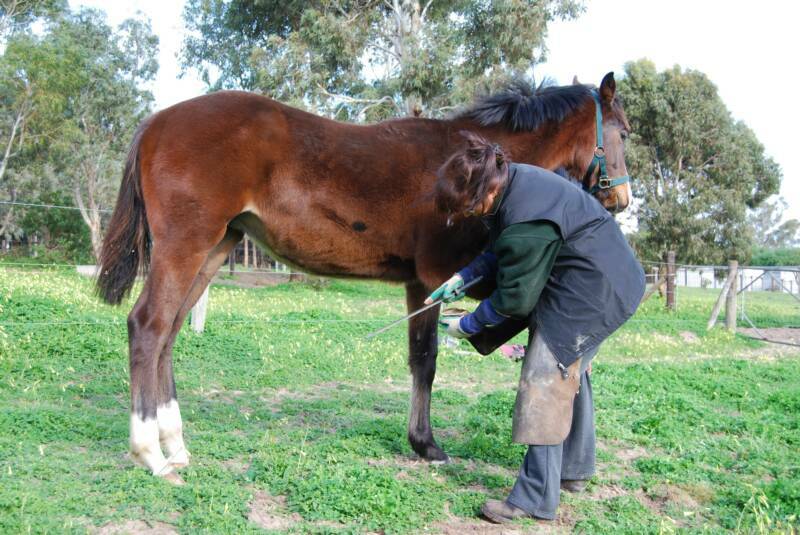 Unfortunately this is getting more and more common and is imho worse than the conventional practises of shoeing. At least the conventionalists did not know any better. Our modern day barefooters, however, should. And NO: Booted hooves are NOT natural hooves. Even though the hoof can have hoofmechanism in the boot, the hoof is not allowed to articulate with the ground. Only a naked hoof is a natural hoof. Boots should not replace shoes. There is no excuse to ride horses with pathological feet or push them beyond their natural design limitations in the name of competition. November 2007: I am excited to announce that I have a new tool in my "toolbox": A BioScan BioLight Therapy unit and Treatment boots. I have been working with Red Light (photon acupuncture or photopuncture) for a number of years now, but was always interested in the Bioscan technology and the possibility to be able to pinpoint trouble areas. I will update my webpage with a page dedicated to this new service, which completes my dedication to the fantastic possibilities of photon therapies! What can cause the hoof to contract? September 2008: I haven't made an up-date for a long time. A lot of things in my life have changed and I have to restructure my business accordingly. From now on most of my teaching work will have to stay at "Yarraman Central" (Bass, Victoria) . Details will be available soon and will be posted on the workshop page. Student accommodation will be available. I will do my best to help those in need. Watch for further up-dates on this page. April 2010: I am happy to announce that my student Mandy Etherton has graduated as only Australian participant of the Equine Soundness course (based in South Carolina, USA) and is now one of the few trimmers in Australia who have completed an overseas based professional education course.for hoof care providers. My beloved ex-riding-school pony "Blaze" was put to rest at the age of 43 after a paddock accident. I will miss her for ever and her little face looking into the living room, demanding her wheat-bix! Blaze taught countless children to ride at MSPE in Melbourne and came to me to retire. I was lucky enough to have her with me for six years. A successful tour to Australia in May 2012 has resulted in the graduation of three more accredited hoofcare practitioners through Claudia Garner's International Equine Soundness School of Hoofcare. After she completed her final practicum with her students in Queensland, Claudia conducted a Seminar and a Continued Education workshop in Victoria before she returned home to South Carolina. With her return to the USA, I am authorized to conduct Equine Soundness Seminars in Australia, and am looking forward to bookings. If you are interested, please contact me or the Equine Soundness School. Rest in Peace, beloved little Munschkin. Thank you for all you have taught me. I am what I am because of you. Love you little pony! The Equine Soundness School is now based in Australia! Right here in Bass, Victoria! I am excited and honoured to take over Claudia Garner's amazing work of more than 8 years. She has taught countless people about a natural hoofcare alternative and has educated a number of highly skilled and proficient hoofcare providers all over the world. So far Australia has 5 practising ES Alumni, who are outstanding "real" practitioners with answers that others still seem to be researching. Please check out this school - the vocational education is unsurpassed! Uno Alla Volta - One At a Time!